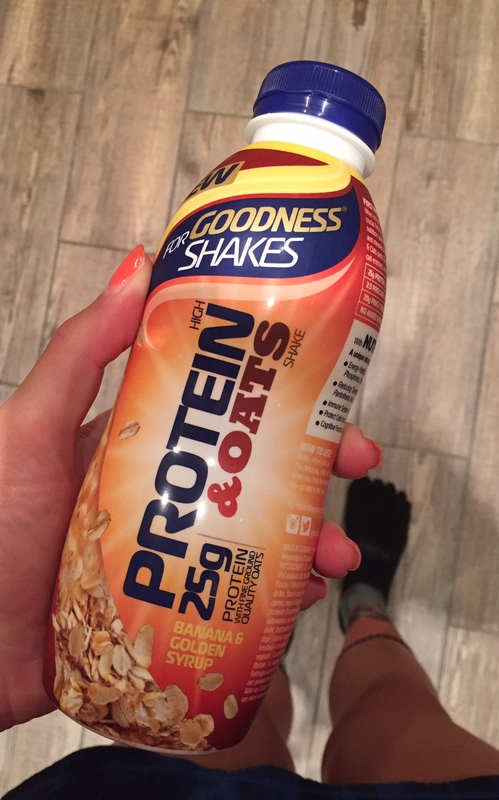 I was fortunate to be sent a bottle of the new For Goodness Shakes Protein & Oats Shake to test out and give some feedback. I’m a big fan of FGS recovery drinks so based on my experience with that product I was pretty confident I would like this one. The bottle is designed as per the FGS usual design so fits in well with the brand and gives you the feeling of comfort that comes from familiarity. I like the colour scheme as it catches your eye. Packed with 25g of protein, 37.5g of carbohydrate (of which sugars 23.8g) and delivering 276 calories in one bottle that is a fair amount of bang for your buck. I tried this out as my breakfast before an 18 mile run whereas I would normally have a bowl of porridge or a bacon and egg ciabatta and found that it held me over quite well until the 13 mile mark then I took on a handful of nuts to keep me going until 18 miles. I probably could have lasted the full 18 miles but wanted to keep enough energy in the tank. I would normally take on energy before that stage in a run anyway for a proper training run. I had the ‘Banana & Golden Syrup’ flavour and it tasted just like a banana smoothie. It wasn’t too sweet or thick, a bit thicker than the recovery drink I am used to but went down very easily and sat well in my stomach. I had it only half an hour before I set off running and I had no issues of cramps or liquid sloshing in my stomach. The texture was simply smooth, there were no chunky bits which is great as that would put me off! I definitely felt it satisfied me in the morning, especially being summer it felt refreshing to drink my breakfast instead of a hot breakfast. I will definitely keep a bottle of two handy in the fridge as a quick pre-run/workout fuel without it sitting to heavy on my stomach. I could see myself using it as a fuel source alone before a short run (up to half marathon) but for anything longer would need more energy, or use this alongside some food. You can find these for RRP £2.50 in your local Tesco, Asda and Waitrose, though sometimes you will find them on offer.